The overall objective of the European Evaluation Helpdesk for Rural Development (Evaluation Helpdesk) is to contribute to the improvement of evaluation of EU rural development policy. It therefore supports Directorate-General for Agriculture and Rural Development, Member States and other evaluation stakeholders in meeting the objectives of the Common Monitoring and Evaluation System (CMES), and in facilitating networking between them. 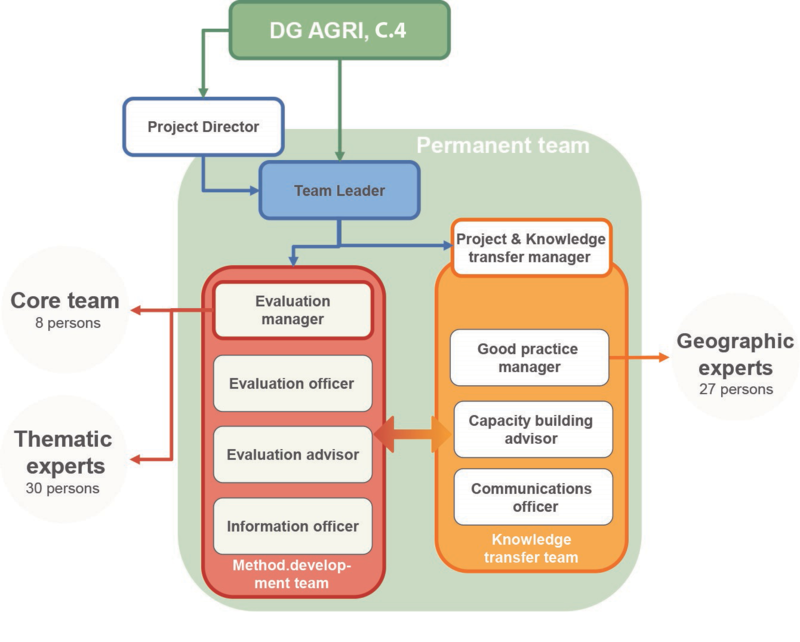 The Evaluation Helpdesk is one of the two support units of the European Network for Rural Development (ENRD) and works under the guidance of DG Agriculture and Rural Development (Unit C.4 "Monitoring and Evaluation"). assessment of the evaluation components of the 2017 and 2019 enhanced Annual Implementation Reports. A Brussels-based permanent team is supported by non-permanent core team members, geographic experts in each Member State and a pool of thematic experts. The permanent team carries out the daily work, liaises with the European Commission and coordinates the expert team. The core team provides methodological know-how and supports in drafting evaluation-related guidelines. The thematic experts bring specific expertise and are only involved in the Evaluation Helpdesk’s work when their specific skills are required. Who is the Evaluation Helpdesk’s target audience? For the European Evaluation Expert Network 2007-2013, click here.